"Azalea Path Arboretum& Botanical Gardens." Exciting new changes happening at Azalea Path! For those choosing the Azalea Path as their wedding location, we will soon have the facility to host wedding receptions! One of the many chainsaw carvings found at Azalea path. 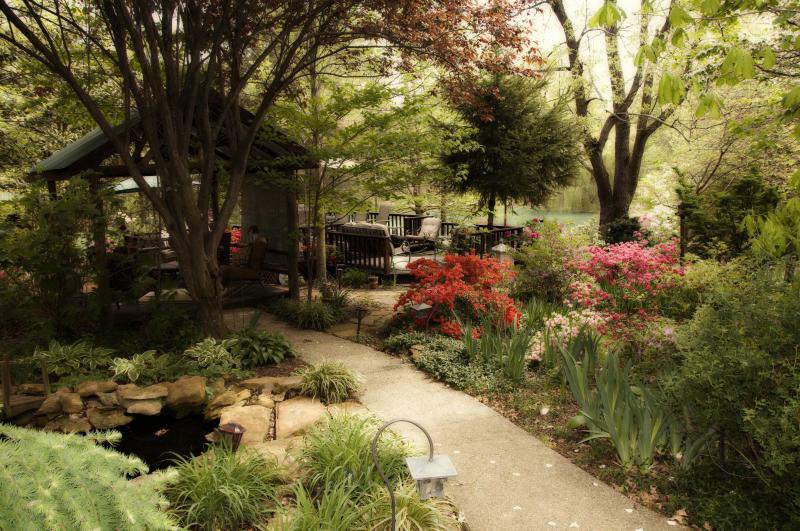 Started in 1979, Beverly Knight took an overgrown forest and magically created a gardener's piece of art. Azalea Path Arboretum and Botanical Gardens is a nonprofit and privately owned facility located on the Gibson/ Pike County border in Southwestern Indiana. What began with 15 acres and only a few azaleas and perennials has flourished into more than 4,000 azaleas plus a large variety of unusual plants and native Indiana trees. "Azalea path has one of the largest collections of azaleas in the Midwest, if not the largest." Azalea Path would like to offer a special thanks to their volunteers. Jayne Oldham of Evansville, IN. June Neyhouse of Princeton, IN. Download a pdf brochure for Azalea Path Arboretum & Botanical Gardens. Gibson County Visitors & Tourism Bureau. opyright 2010 Azalea Path Arboretum and Bontanical Garden Inc. All rights reserved.